After a few planning meetings, you lose no time and go on an explorer trip in the first country. There you will be welcomed by the WIF Ambassador walking you through everything you need to know about the country. 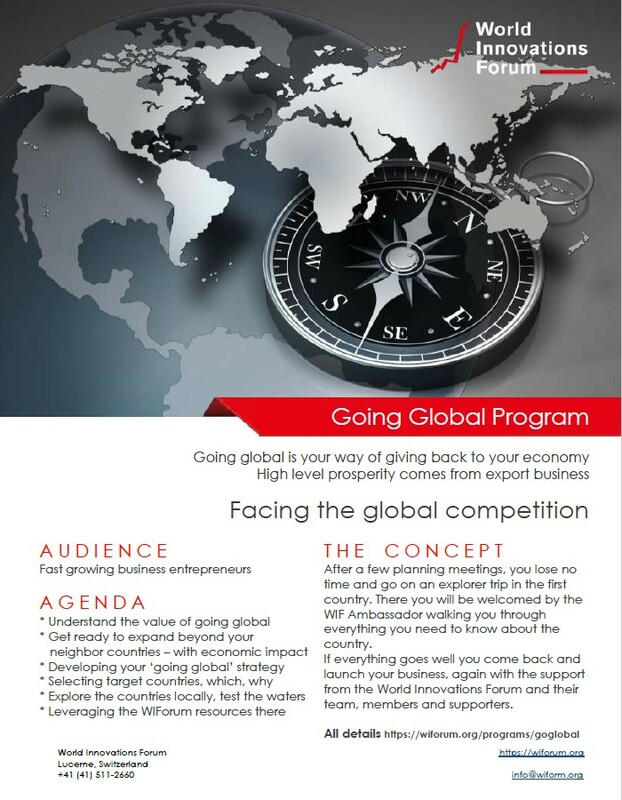 If everything goes well you come back and launch your business, again with the support from the World Innovations Forum and their team, members and supporters. on to get ready is part of that program. Who knows whether you are really ready? We believe we have a good handle on what it takes. Some are more adventurous, others more careful. Yet, everybody has a window of opportunity. It isn’t only about you to be ready, it is also the market. And then there is fearce copetition that may take a leap befor you. Readiness is always a fragile position. We will help you explore basic readiness as well as risks and opportunities to assess your timeframe. Obviously there is no guarantee – only risks, we help to mittigate as good as possible. When ready we help prepare Once you go, your competitors will follow. Timing is everything – also in the preparation itself. You will want to make the local markets aware of you. You will speak with many people to explore the current market conditions, look for partners, seek early customer, learn all about the local way of doing business. All that and more needs preparation. Equally important: You don’t want your current business to slip, but continue to grow. Low cost expansion Most likely you don’t have deep pockets to go international. No young business has. We will help you optimize resources, foreign market entry campaigns and launches, country by country. We all will be with you – on every step of the way. Once you go, we will make introductions to the most relevant people for your particular business case. Ambassadors, local customers, corporations, community members, local officials and others will be available to help. We help you market in the foreign countries you want to go and build the necessary support for the respective market. Tell others Post your experience as you go. Unlike most people think, sharing is not a one way street. While you help others by sharing your experience, you will get feedback from yet others in return. It’s an important part of the path you are going. You are essentially going global with the support from the entire eco-system. That is the power which only the global network can provide.You can post your experience on your block, do it on Medium or other public blogs and obviously on the Society3 blog. You select or do it all together. The wider you spread it the more feedback you may receive. Going global is just the beginning. You will want to manage growth in several countries with people you hire and trust. You will want to have a robust team expansion plan and a more sophisticated talent acquisition strategy than you ever thought. Your company is run by people and by people only. The best KPI driven management structure won’t help when you hire and grow at the same time, And also here we will be able to help. If you have a base idea what you want to do, let us know and we explore the possibilities.